Key U.S. leaders are expressing a growing optimism that decades of hostility on the Korean Peninsula are closer than ever to coming to an end. "I don't think he's playing, I don't think he's playing," U.S. President Donald Trump said at a White House news conference, when asked about Friday's historic summit between North and South Korea. "It's never gone this far," Trump said, standing alongside German Chancellor Angela Merkel. Trump added the U.S. will be "setting up a meeting very shortly," but didn't specify a timeline, saying officials are considering two or three possible sites for his much-anticipated summit with North Korean leader Kim Jong-un in late May or early June. Earlier Friday, Kim became the first North Korean leader to set foot in South Korea, when he crossed the border to shake the hand of South Korean President Moon Jae-in. The two leaders agreed to work toward removing all nuclear weapons from the Korean peninsula and vowed to pursue talks that would bring a formal end to the Korean war. North Korea has in the past made similar commitments about its nuclear program, but failed to follow through. Asked whether Pyongyang's commitment is real this time, Trump said "we're not going to get played." "This isn't like past administrations. We don't play games," said Trump, adding that previous administrations had been "played like a fiddle." "We will come up with a solution, and if we don't we will leave the room," he said. U.S. Defense Secretary Jim Mattis also expressed hope Friday that talks with North Korea will bear fruit. "I can tell you that we are optimistic right now that there's opportunity here that we have never enjoyed since 1950," Mattis said before a meeting at the Pentagon with the Polish defense minister. "I don't have a crystal ball," he added. "So, we're going to have to see what they produce." The White House and the Pentagon see the diplomatic progress as the result of Washington's "maximum pressure" campaign, which included heavy sanctions and frequent threats of military force. Trump had said he was prepared to "totally destroy" North Korea if necessary. "Things have changed very rapidly from a few months ago -- you know, the name calling and a lot of other things," Trump said Friday. For now, the threats have faded. But it's not clear how much North Korea is willing to offer at the talks or what it will demand in return. Nor is it clear how much the U.S. is willing to give. Mattis Friday did not rule out the possibility U.S. troops could come home from South Korea if a Seoul and Pyongyang are able to reach an agreement. "That's part of the issues we'll be discussing in the negotiations with our allies first and, of course, with North Korea," he told reporters. "Right now we have to go along with the process, have the negotiations, not try to make preconditions or presumptions of how it’s going to go." On Friday, Moon and Kim's statement said the two leaders "confirmed the common goal of realizing, through complete denuclearization, a nuclear-free peninsula." After the meeting, Trump tweeted his support for the talks, saying "good things are happening, but only time will tell!" Fifteen minutes later, Trump tweeted: "KOREAN WAR TO END! The United States, and all of its GREAT people, should be very proud of what is now taking place in Korea!" 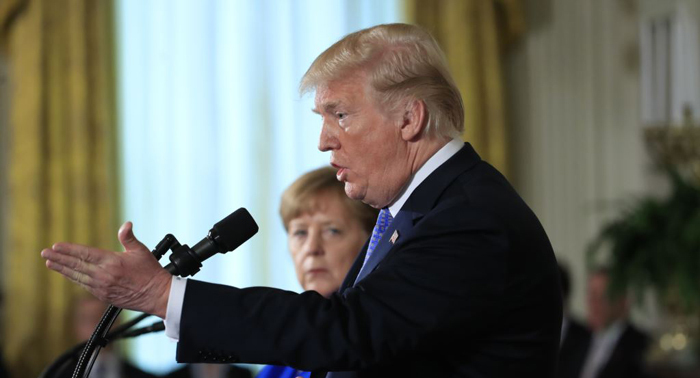 "I think the responsibility has fallen on the shoulders of the president of the United States," Trump said alongside Merkel. "I think I have a responsibility to see if I can do it."